The steam mop is a wonderful and convenient cleaning tool, but how you use it makes a world of difference in cleaning efficiency. This is a very innovative floor mop which can save time, but it does need some prep work if you want clean floors in the end. Steam mops work by heating up water from a reservoir inside the mop to a temperature of nearly 250 degrees Fahrenheit and sending a jet of steam down into a mop pad covering the head. The stems soak the pad and assist its ability to loosen dirt and grime off the floor. Unlike traditional mops, the mop head absorbs the dirt, and the heat of the steam is able to kill most of the bacteria and dust mites on the floor. It is not only a faster means of cleaning but a more sanitary one. Compared to a mop and bucket cleaning system, the steam mop makes it extremely convenient to quickly touch up floors. But because they are so easy and fast to use, you may be tempted to overlook necessary guidelines. Steam mops come in a variety of styles, sizes, ways to attach the mop head and amount of power or steam generated. Some have better features than others. But features aside, any model you buy requires that you follow certain practices. Prepping the floor is key. Steam mops work best if all loose dirt and grit are removed. For best results, sweep or vacuum before you begin. A steam mop is for maintenance cleaning. If your floors are heavily soiled, you will be smearing dirt all over the floor with hot steam. Deep cleaning by traditional methods is necessary for heavily soiled floors. Use multiple mop pads. Keep several clean mop pads on hand, and change them as soon as they get dirty. Use only on sealed floors. Make sure your flooring material is suitable for steam cleaning. Some flooring materials can be damaged by steam cleaning. Steam cleaning a floor should be your option for all routine maintenance washing. For most people, this means using it once a week, although it might need to be done more frequently in active families or during certain times of year when more outdoor grime is carried in. Every month or so, augment the steam cleaning with a deep floor scrubbing done the old-fashioned way. It's imperative that you vacuum the floor before steaming. You could alternatively sweep if you don't have a vacuum, but good suction power will pull lint, dust, and other surface debris from the cracks, preventing them from dirtying the mop pad. Once vacuumed, your floor is ready to steam mop. There are several dual-function sweeper/steam mop tools on the market. They can be very handy and work reasonably well when it comes to cleaning up small messes or areas without getting the vacuum cleaner out. But before steam-mopping the entire floor, a vacuum gets a lot more dirt off the floor. That means less dirt on the mop pad, so a cleaner steaming. To avoid trailing or smearing dirt around as you steam your floors, have several mop pads on hand so you can change them as required. Steam mop pads are reasonably priced, generally wash up nicely in the washer, and can be hung to dry. Read your product manual to confirm care instructions for your steam mop and accessories. Changing the pad whenever it becomes dirty ensures a clean steam mopping. This is not an efficiency issue but one of general floor care. 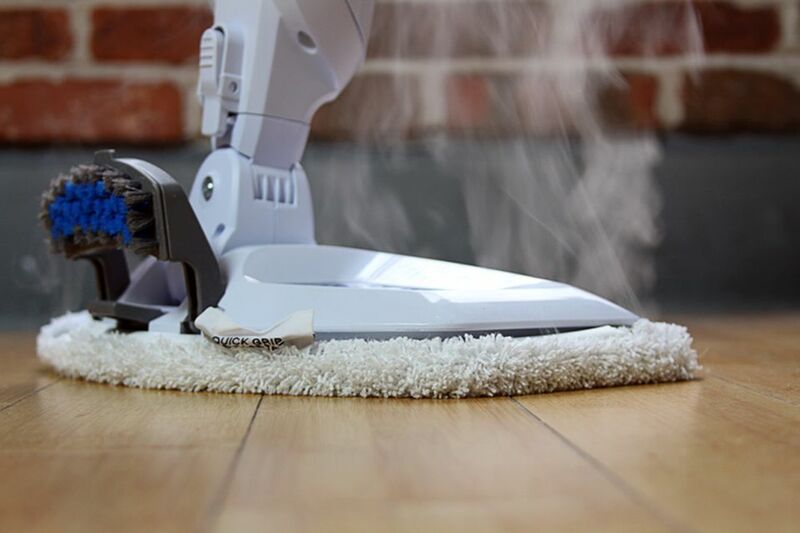 Steam mops should only be used on sealed floors because excess moisture can damage some surfaces. Also, you should never leave one plugged in and unattended while you do something else. Moisture can accumulate in the pad and could mar the floor surface. Steam cleaners are generally safe to use on any type of vinyl or linoleum floor, on ceramic or porcelain tile, and on some forms of laminate flooring. Make sure to consult the flooring manufacturer for any warnings regarding steam cleaning. Some laminate flooring marketed as water resistant may be fine for steam cleaning, while other products may carry a warning against it. Steam cleaners may drive steam down through joints between laminate planks and can damage the core layer. Water-resistant laminates are typically made with special waterproof resins in the core layer, and these floors may accept steam cleaning just fine. Manufacturers of steam cleaners often make claims about the devices being safe for use on wood floors, but this is debatable, at best. While a properly sealed wood floor may accept light steam cleaning, most wood floor manufacturers caution against the use of any cleaning methods that rely on water or steam, which can discolor or warp wood. A wood surface can be tested by dripping a few drops of water on the floor in an inconspicuous area. If, after five minutes, the water has not been absorbed into the wood, then it is probably safe to use a steam cleaner. Once you have verified that the floor surface is safe, go ahead and wash the floor with your steam cleaner. Attach a mop pad to the foot of the steam cleaner, fill the water reservoir, and power it up according to manufacturer's instructions. Keep the steam mop moving constantly as you wash, and don't allow it to idle on any given spot. Change the pad as it grows dirty, since you don't want to simply spread dirt around the floor. For a thorough cleaning, you may want to make multiple light passes over the entire floor. Your steam cleaner likely came with recommendations on how to launder the pads, but generally it works fine to simply machine-wash them with other whites, then hang them up to dry. This works especially well on microfiber pads. Keep a good supply of clean pads so you are ready to go the next time you wash floors. A steam mop can be an excellent way to perform routine weekly maintenance washing of your floor. Just make sure to remove loose dirt by sweeping and vacuuming before you begin.